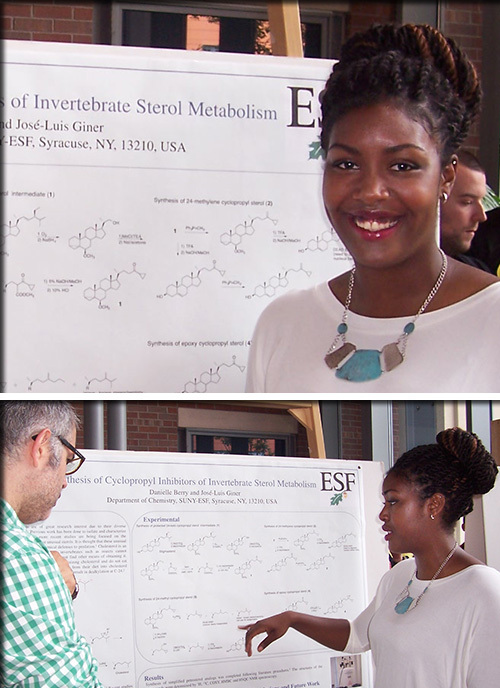 ESF senior and Collegiate Science and Technology Entry Program (CSTEP) student Danielle Berry won second place for her poster presentation in the chemistry and chemical sciences category at the Emerging Researchers National (ERN) Conference in Science, Technology, Engineering and Mathematics conference in Washington, D.C. This national conference for undergraduate and graduate science students, held Feb. 19 thorugh 21, is hosted by the American Association for the Advancement of Science and the National Science Foundation. Four ESF CSTEP students and their advisor attended the conference designed to prepare college students for science careers in the global workforce. Berry's poster, titled "Synthesis of Cyclopropyl Inhibitors of Invertebrate Sterol Metabolism," described research she did last summer in Dr. Jose Giner's laboratory, creating tools to explore the inhibitory effects that algal sterols have on the metabolism of arthropods in the marine food web. Berry is considering furthering her education in the field of environmental chemistry.